195 system replacement icons with 4 folder types crafted in aluminum. Is there a better alternative to Pry System? Is Pry System really the best app in Icons category? Will Pry System work good on macOS 10.13.4? Pry System is a system replacement set with 4 folder types crafted in aluminum. All icons include 512 px resolution for total Leopard compatibillity. Furthermore the pack includes gorgeous optical discs as well as 2 types of Hard Drives. 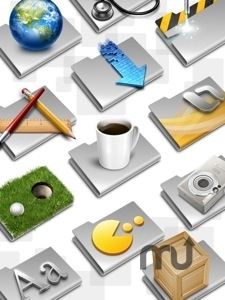 A total of 195 icons is included in the pack. Pry System needs a rating. Be the first to rate this app and get the discussion started!